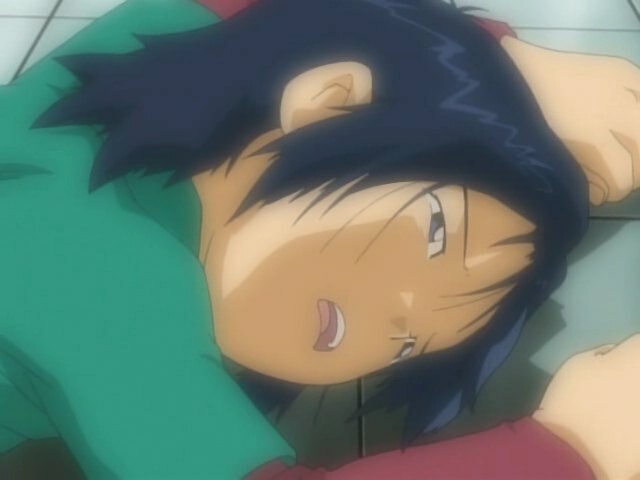 Digimon: System Restore: Frontier Episode 30: O, Brother, Who Art Thou? Whoa, hey, music! So here we are at the dramatic unveiling of Koichi's story, complete with its own backing song that is actually appropriate to the scene and not some generic punk rock or rehashed ska. There's plenty of earnest angst going on here, not only as Duskmon grapples with these memories but also Koji trying to make sense of it. The whole episode seems to be little more than a framing device to get this story out in the open; events like Cherubimon and Patamon taking more active roles seem like side notes by comparison. While this does drag the plot down to a snail's pace, and it's hard to give the episode full marks as a result, the story is worth taking some time to digest. Koichi gets the worst shake of any kid in the entire franchise. This is a bold statement when you've got the likes of Ken, Jeri and Ryouma to contend with (and if you add adults to the picture, you can make a strong argument for Oikawa), but where all of these figures got royally jerked around by the forces of evil, Koichi was the only one who never got a say in the matter. Those other kids may not have known what all they were getting into, but they were dumb enough to want in. Koichi not only doesn't get a choice, but it's an interruption to a life already in upheaval. 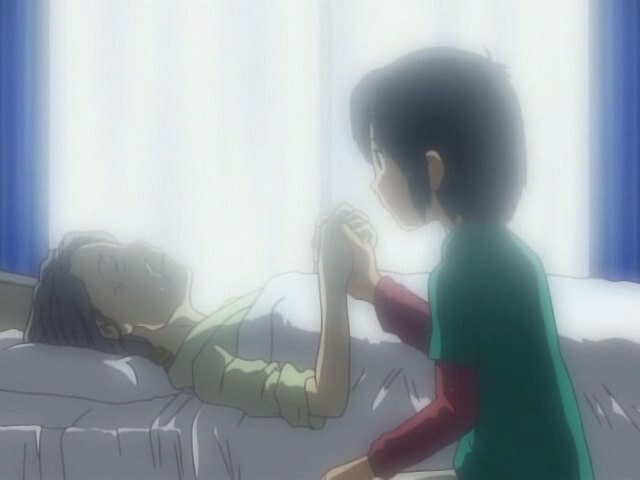 First, his dying grandmother tells him that he has a brother. Which means his mother has been hiding this important fact throughout his young life. When he happens across Koji on a train, bad luck prevents Koichi from following. In desperation... well kids, this is a lesson on why you shouldn't run down stairs. Cherubimon takes over from there and uses this poor kid's soul as a puppet. Much in the way that Takuya and Koji's power overshadows the others down the road, Koichi's angst makes everyone else's lives look great by comparison. The entire Sakkakumon arc made a big deal about everybody's problems, devoting entire episodes to JP, Tommy, Zoe and Koji. Three of the four didn't have terribly serious problems and their episodes made mountains out of molehills. So when Koichi shows up with a real mountain, it packs a serious dramatic punch. It doesn't quite make the Sakkakumon stuff worth it as this sort of thing can stand on its own, but the turnaround is downright nasty. Speaking of nasty, it is impossible to like Cherubimon in this state. “Like” of course, meaning enjoy him as a villain, much in the way we salute magnificent bastards like Myotismon or lash out at Kurata with obscenities. Cherubimon's shadowy figure, growling voice and awesome power drains almost all of the fun out of the entire show (the one saving grace being Patamon, which is laughably appropriate). He has all the nuance of the color black, with about as much to ponder at this point. You can perhaps wonder how he got this bad, as he's clearly far beyond the whole “corruption of power” thing. This is pure evil, which isn't any fun as there's no sign of the force controlling him. With Duskmon struggling with human memories, Cherubimon does something very confusing in drowning Duskmon with Koichi's bad experiences. It gives us a little more insight, but feeding Duskmon more of the very thing that's restraining him is an odd move. Unleashing the beast spirit of darkness, which is absolute uncontrollable bloodlust against the warrior of light, is a more reasonable action. 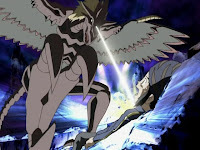 Koji is a sitting duck against Velgemon, and it takes a proper intervention from Ophanimon via Koji's digivice to... drown Velgemon with Koichi's bad experiences. Apparently good guys can use angst as a weapon too. While it's easy to buy Patamon's innate sense of knowing where the action is, and his insistence on waddle-flying his way towards it is adorable, Takuya wants to just pick a direction at random and start walking. At times during the continued Beowolfmon/Duskmon stalemate, it feels like they're using random battle settings from video game fighters just because they need a backdrop. They go from the dark cavern city to the underground pool to the crater that emerges after they blow up a whole goddamn butte. Those other four kids do some split screen evolution when trying to escape the black spiky death from above Cherubimon throws at them (he must have horrible aim as nobody got impaled), but it's a waste of time anyway as the death spikes are impenetrable. Patamon comes through again. I watched this episode today anticipating your review and I also noticed that the beginning of this episode (the repeated stalemates between Beowolfmon/Duskmon) tends to come out a lot more at you after you've figured out the whole twin thing. For instance, the brief shot where you see Koji and Koichi's human images inside Beowolfmon and Duskmon serves as a pretty heavy-handed reminder that Cherubimon is effectively forcing twins to fight each other to the death. Given the way he locks up all the other kids outside right after, it really feels like he's getting some kind of gladitorial-style spectacle out of it. It's a bit easier to hate Cherubimon a bit more passionately like that.